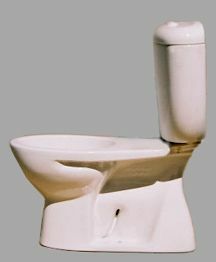 A modern concept close coupled washdown 1.6gpf or 0.8gpf dual flush toilet featuring water saving dual flush technology. A half flush for "number 1 and a full flush for "number 2". The bowl has been designed with a 12" outlet and overall length from the finished wall of 28 3/8". 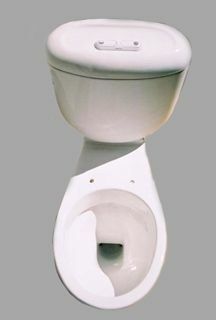 Low profile push buttons are easy to operate and have durable molded symbols to clearly identify the flushing volume. All Caroma toilet suites are supplied standard with Caroma Duoflo, dual flush technology and either a 4" trapway or a 3" trapway in the 305 series bowl. These bowls are almost impossible to plug, but have very little water in the bowl, and don't rinse well. With these bowls, it good to have a brush handy to keep it cleaned. 12" or 10" adjustable roughin. 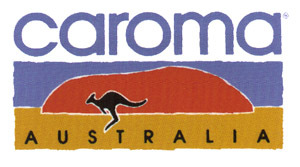 Caroma 270 Tasman dual flush, with washdown bowl and plastic tank. Caroma 270 dual flush with washdown bowl. 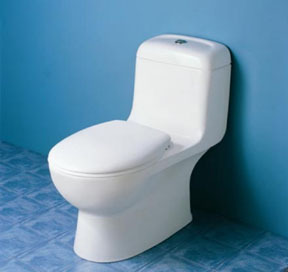 Bowl : Caravelle 305 - 1.6 / 0.8 US gallon 6 / 3 liter full flush washdown bowl with open flushing rim. Outlet: Floor mounted 12" (305mm) outlet connection. Tank : Reflections USA Tank - has a free fitting lid and is suitable for domestic and light commercial applications. Vandal Resistant Conversion Kit - A simple to install conversion is available for use in commercial areas. Code No. 413276. Inlet Valve and Overflow: Standard Bottom Entry tank - available as left hand inlet which is interchangeable and incorporates a Fluid Master inlet valve. Internal overflow only. Fixing: The tank is fixed directly to the bowl with a robust base fixing system without the need for wall fixing. Seats: The following Caroma seats are recommended - Caravelle & Trident.